If it is not acute, call your doctor. If you can't wait, call the Legevakten: 22 93 22 93. If life and health is in danger call the emergency number 113. Telephone: You can use your own mobile phone. Keep the sound low and show consideration. Valuables should be left at home. Transport home in a Taxi: If you due to health-conditiones can't use a private car or take the bus/tram, you can get special transport. There is a set fee. The Kiosk in the lobby is open 08:30 - 19:00 on weekdays, on Saturdays 11:00 - 19:00 and on Sundays 11:00 - 18:00. Smoking is not allowed on the hospital premises. Patients may smoke at a designated area by the entrance from the park. There is a mailbox outside the main entrance. Stamps may be bought in the kiosk. The Pharmacy is open Monday to Friday 08:00 - 16:00. A library trolley and a kiosk trolley visits every Thursday. The hospital church is always open. The hospital Chaplain is always available and is experienced with talking to people in different situations. Contact with representatives of other religions/ life philosophies can be arranged. Please notify the staff. There are rooms available in each section to be quiet in or to have a private conversation. The doctor's visit occurs between 10:00 - 15:00 on all weekdays. Meals are served from a buffet. There are three choices for dinner, including a halal meal. Visiting hours at most sections are between 13:00 - 19:00. Thank you for showing consideration for other patients. Patients who do not speak Norwegian can have an interpreter from the hospital interpreter service. Signal the staff if you need an interpreter. Download a brocure from NAKMI here. You have rights to access all information about your illness, about examinations done and treatment administered. You also have rights to see your journal, including rights concerning corrections, deletions and privacy measures. Please tell the staff if there is anything that ought to be improved. For scheduled treatment you may choose hospital. You can find more information about this at sykehusvalg.no or phone 800 41 004. 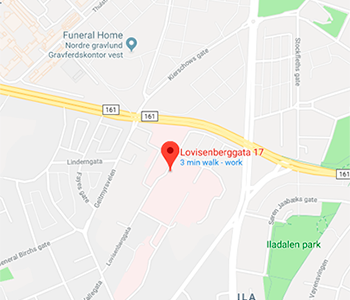 Lovisenberg Diaconal Hospital is a local hospital providing medical services for the inhabitants of four City Districts in Oslo: Sagene, Gamle Oslo, Grünerløkka, and St.Hanshaugen including Sentrum, about 25 percent of the city's population. In addition psychiatric services are offered to several other city boroughs and our hospice offers palliative care. Our departments have a wide range of specialists, and the health care we offer is managed in close co-operation with the other hospitals and health service providers in Oslo. The surgical department receives patients for scheduled operations from all parts of Norway within orthopaedic and ear nose and throat surgery. The orthopaedic section conducts about 1000 hip and knee implants and treats 500 shoulder patients with advanced arthroscopic operations a year. This makes the hospital one of the leading orthopaedic sections within these fields in Norway. The concentration on planned surgery, excluding emergency and trauma surgery, makes the department a very efficient unit, with stable operation volumes and low rates of hospital infections. The department has numerous ongoing research projects within their fields. The TAKO-centre is a National Resource Centre for oral health in rare medical conditions. Patients are referred from the whole country for assessment, diagnosis and treatment planning. Other important tasks are pre- and postgraduate training, lectures to parents and patients' groups and research. The centre also includes a dental clinic where patients treated for long-term drug abuse and/or chronic psychiatric disorders receive dental treatment. The hospital is owned by the private deaconess foundations Diakonissehuset Lovisenberg and Menighetssøsterhjemmet (Parish Sisters Home). It operates within the framework of Public Health, with a long term contract with South-Eastern Norway Regional Health Authority. With a staff of approximately 1300 person/years, the hospital has 228 beds, and an extensive out-patient facility. The hospital has a modern x-ray department, a clinical laboratory, and a pharmacy. There is an interpretation service for patients with other mother tongues than Norwegian that will be ordered on request. The hospital was founded in 1868 by the pioneer Cathinka Guldberg - the first trained nurse in Norwegian medical history. The word: "deacon" comes from a Greek verb, meaning "to be at someone's service", "to take care of". The mission of each individual employee and our organisation as a whole is to offer treatment and service of high quality to all our patients, with equality and respect.